A character can own up to 96 kinds of items by default, and you can expand this capacity by equipping an additional bag at the Character Status > Item Menu. Carrying too many items, however, slows you down and eventually immobilizes you. It will also stop SP recovery! 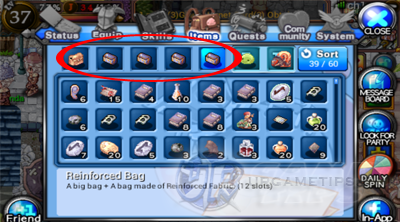 To extend your inventory slots, equip a bag at the Character Status > Item Menu. You can equip up to 5 Bags total. - This bag has been loved for a long time. - Default bag given at the start of the game. - Note: You can't unequip this bag! - This durable bag is specially made for beginning adventures. - Given as Quest rewards. Just follow your quests. more bags will become available via quest rewards. Big Bag (8 Slots) HOT! - This bag can contain all sorts of things. - Buy at Cash Shop. - Daily Spin chance item. Open Character Status screen then select Daily Spin. - Buy from other players around 50k~100k (price varies per server or seller). - Buy at Cash Shop or win at Daily Spin if item is included. Promotional/Event Bags or Item Bundle NEW! - Watch out for cheap Bags for sale in the Cash Shop! 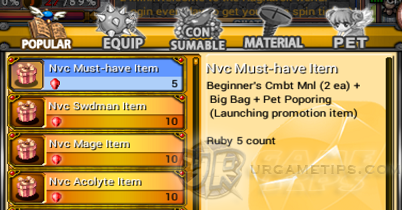 Popular or Equip section for only 5 Rubies!. - Sell your Small Bags to the NPC to get rid of them. Reinforced Bag below), or buy them from other players. - Composition Artificier NPC. Located below the West Guards of Lan Forta. 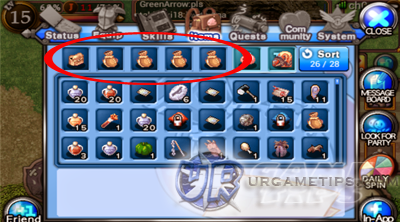 - Select the "Special Items" option to view all Bags available for crafting. - A bag made of thin bear hide. - Materials: x20 Thin Bear Hide from Bigfoots and Pink Bears. - 1,000 Zeny crafting fee. - *Note: It looks like Thin Bear Hides are not available at the moment! - A bag made of bear hide. - Materials: x20 Bear Hide from Bighands, Bear Kings and Legend Bigfoots. - 5,000 Zeny crafting fee. - *Note: It looks like Bear Hides are not available at the moment! Reinforced Bag (12 Slots) HOT! - A big bag + a bag made of Reinforced Fabric. - 50,000 Zeny crafting fee. - Get 4 of these as soon as possible to get enough space for pots, loots and more! - A brand bag made of Artisan Fabric. - 100,000 Zeny crafting fee. - Recommended for Ruby users! - Materials above can be bought from other players, prices may vary per server. - Brand Bags, Reinforced and Artisan Bags are Non-Tradables! you 4 more item slots. - Buy Pet Eggs in the Cash Shop (generates random pets). - Event Manager: You can claim some Pets here too by using Gold Coins. - Buy from other players, prices may vary per server. when sold to NPCs. Ex: Jeloppy, Mushroom Spore and more. are too far from the nearest town or city. like Jellopy and Mushroom Spore, or Grade 1 equipments that you don't need to avoid movement penalties later on. 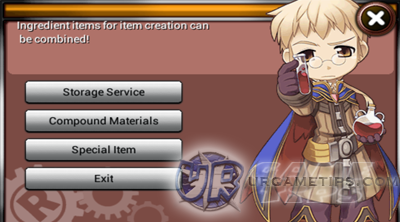 - You can also sell your items to other players through the "Register Auction" NPC. least 10,000 Coins. Store items like Time Capsules, Cards, Runes or any item that you would like to save for later use. - Enable/Disable Auto Pick-up function under Status Window > System > Options. +EXP items. Keep what you think is useful for later use, especially items like stat and skill resets. go to the Composition Artificer NPC in Valder to exchange 20 Gold Coins into 1 Gold Ingot. This will greatly compress your Gold Coins into 1 or 2 slots only! Make "Settle Auction NPC" as your Kafra! NEW! - Yes, the NPC where you settle sold or expired items. the Cash Shop or from other players (Ruby sellers) if you prefer Zeny. store, preferably an item that you will not use at the moment. Price it high so that no one will dare to buy it. Let it expire for 2 days and do not settle, just let the item stay there.